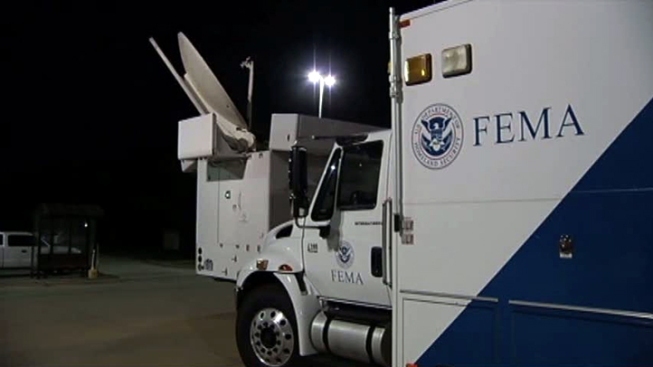 Ten people from the Federal Emergency Management Agency's regional headquarters in Denton are heading to Virginia to help states along the East Coast respond to Hurricane Sandy. The incident management assistance team includes specialists in mass care, communications, logistics, and operations. "One of the first things we do is, we get onboard, take a look at what’s going on, kind of get a good sense of what’s going on on the ground, working closely with the state, their personnel and determining if there’s any shortfalls, if there are how can we fill those shortfalls, and make sure that everything’s being handled as it the threat comes in and makes landfall," Robert Alvey of FEMA said. Denton is also sending 2.75 million meals, 775,000 liters of water and several communications trucks from a staging area in Louisiana. The team leaves Saturday morning and expects to be fully operational on Sunday.